Catherine of Aragon had been married to Henry VIII for 16 years when he started to doubt the validity of their union. The King desperately needed a son to secure the succession, and he saw Catherine’s failure to give him an heir as a sign that God was displeased with the marriage. Catherine had been previously married to his brother Arthur and so, Henry argued, a papal dispensation wasn’t enough to make the union valid. It was around this time that Anne Boleyn entered the picture and the King would stop at nothing to annul his first marriage and contract a new one to the woman he loved, hoping to finally have a son with her. As we all know, he succeeded in getting rid of his first wife and Catherine spent her last years discarded, unhappy and alone. To understand why this happened, we need to examine Catherine’s obstetric history. The Queen had fallen pregnant several times, but all her pregnancies, bar one, ended in miscarriages and stillbirths or produced babies that would die shortly after their births. Only a bouncing baby girl, the future Mary I, survived childhood. It is impossible to say exactly how many times Catherine fell pregnant, given the scarcity of primary sources and the fact that miscarriages and stillbirths, even when suffered by a Queen, weren’t, at the time, always considered important enough to be recorded for posterity. Still, historians have postulated on the number. Hester Chapman believes that Catherine fell pregnant seven times; A.F. Pollard brings the number up to ten; and J.J. Scarisbrick states that Catherine had “several miscarriages, three infants who were either stillborn or died immediately after birth (two of them males), two infants who died within a few weeks of birth (one of them a boy) and one girl, Princess Mary”. Professor Sir John Dewhurst, author of a paper entitled “The Alleged Miscarriages of Catherine of Aragon and Anne Boleyn” believes that “several” must mean at least three, meaning that Catherine of Aragorn, if Scaribricks’ theory is correct, had at least nine pregnancies. If she only produced a healthy girl, it certainly wasn’t for lack of trying! Catherine fell pregnant again pretty soon, and, on 1st January 1511, she gave birth to a son. The happy event was celebrated with gun salutes, tolling bells and feasting. But this joy was to be short-lived. Little Henry became ill and died on 22 February, only 52 days after his birth. Catherine next gave birth on 17th September 1513, although it is unclear whether the baby, a boy, was stillborn or lived only a short time. The latter option seems more likely as The Venetian Calendar of State Papers records that “a male heir was born to the King of England and will inherit the crown, the other son having died”. Catherine was once again soon with child. Court official De Plein wrote that summer to Margaret of Savoy, saying, “it is said that the Queen is with child and, as far as I know, and can see, it is so”. However, we don’t know exactly when Catherine gave birth nor how the pregnancy ended. The Venetian ambassador Badoer wrote to his senate in November that “the Queen has been delivered of a stillborn male child of eight months to the very great grief of the whole court”. The chronicler Holinshed instead recorded that the baby had been born alive but died shortly afterwards: “In November the Queen was delivered of a prince which lived not long after”. Catherine’s fifth pregnancy finally resulted in a bouncing baby who survived to adulthood, but it was “only” a girl. Mary was born on 18th February 1516, and was received with joy mixed with disappointment. She wasn’t the long-awaited heir but at least Catherine had shown that she could produce healthy babies. Henry optimistically told the Venetian ambassador that “we are both young and by God’s grace boys will follow”. But Catherine would give birth only once more, on 10th November 1581, and the child would be a daughter. Stillborn. It seems that this child was premature, as inferred by a letter written by the Venetian ambassador: “The Queen has been delivered in her eighth month of a stillborn daughter to the great sorrow of the nation at large”. Although it is possible that Catherine suffered further miscarriages (there definitely was time between some of her later pregnancies), it is important to point out that the evidence for these consists of a few phrases in a couple of letters hinting that the Queen was unwell and rumoured to be with child. Therefore, until further proof should emerge, these sentences are merely unsubstantiated gossip and rumours and should be considered as such. It is also very difficult to determine the cause of her fertility problems. 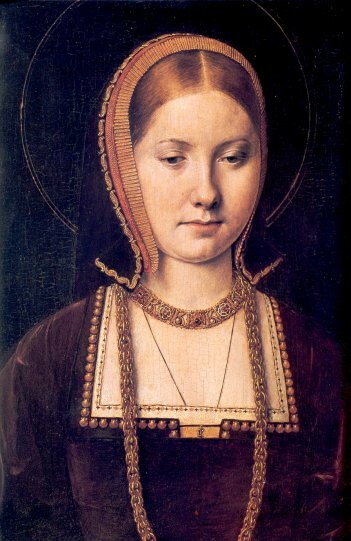 Catherine was very religious and fasted a lot, which may have harmed the children she was carrying. It is also possible that the huge amount of stress she was under to produce a healthy son contributed in no small part to her problems. It is little wonder, though, that Henry, who lived in a very superstitious society, started wondering whether God was displeased with his marriage to his brother’s widow. Of course this doesn’t excuse his appalling behaviour to his first wife, but it helps us to understand a bit better Henry’s obsession for a son and heir and his reasons for wanting an annulment.